Beyond the Wall lies a cold, wintery landscape populated by direwolves, mammoths, and the rugged wildlings known as The Free Folk. These harsh men and women form a constant and savage threat to the grim defenders stationed at The Wall. 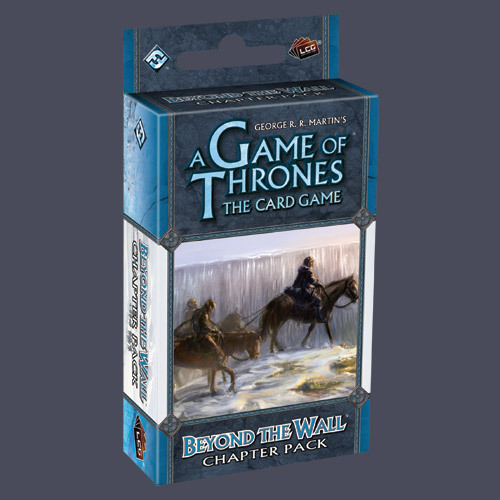 Beyond the Wall is the second installment in the Defenders of the North expansion to the A Game of Thrones living card game, based on George R.R. Martinâ€™s bestselling A Song of Ice and Fire saga. This 60 card pack features 20 different never-before-seen cards designed to augment existing decks and add variety to the A Game of Thrones metagame. An A Game of Thrones: The Card Game core set is required to play. Contains cards 21-40 of the Defenders of the North series.